A huge Delta 4-Heavy rocket stands poised to blast off from Space Launch Compex 6 at Vandenberg Air Force Base in California on Jan. 20, 2011. The mission marked the first launch of the largest rocket launch ever from the U.S. West Coast. This story was updated at 9:45 a.m. ET, Jan. 21. The largest American rocket currently in use blasted off from the California coast today (Jan. 20) carrying a new U.S. spy satellite on a classified mission, making it the biggest rocket launch ever from the country's West Coast. The unmanned Delta 4-Heavy rocket lifted off from Vandenberg Air Force Base at 1:10 p.m. PST (4:10 p.m. EST, 2100 GMT) carrying a secret satellite for the U.S. National Reconnaissance Office. While the exact mission the satellite – known only as NROL-49 – is classified, the rocket's launch was unmistakable. The rocket soared into calm afternoon skies and was clearly visible in television cameras until the classified mission entered a media blackout 6 1/2 minutes after launch. The Delta 4-Heavy rocket is a massive unmanned booster. It stands 235 feet (72 meters) high, making it just a bit taller than a 23-story building. Today's launch marked the fifth flight of the Delta 4-Heavy rocket since its debut in 2004. All four previous launches have been from the Cape Canaveral Air Force Station in Florida. For its West Coast debut, the Delta 4-Heavy blasted off from Vandenberg's Space Launch Complex 6, or SLC-6. It is the largest rocket to launch from the West Coast since the Titan 4B rockets retired in 2005. "This launch marks a significant milestone in our nation's space capability," said Air Force launch director Lt. Col. Brady Hauboldt before the liftoff. "We've really restored a national capability for heavy lift on the Western Range, something we have not had since the last of the Titan 4Bs flew out of Vandenberg. This extends our ability to cost effectively deliver payloads of all sizes and compliments." The SLC-6 launching pad was originally built in 1966 to loft the Air Force's Manned Orbiting Laboratory - a planned military space station at the time - and was later adapted for launching NASA space shuttles from California. NASA did perform some launch pad tests using its shuttle prototype Enterprise in 1985, but no space shuttle missions ever blasted off from California. The Air Force spent three years and $100 million to modify the launch pad to support Delta 4-Heavy rockets, Hauboldt said. The launch pad upgrades give the U.S. defense department the opportunity to launch massive spy satellites like those typically carried by Delta 4-Heavy rockets into polar orbits — the ultimate high ground for observing the entire planet's surface, according to Spaceflight Now. The last launch from the SLC-6 pad was in 2006, when a regular Delta 4 rocket sent up a U.S. military weather satellite. "Today’s launch was the second Delta IV Heavy launch for the NRO in two months and was also the largest rocket ever launched from the West Coast," said Jim Sponnick, vice president of mission operations for the United Launch Alliance. "Most important is the critical NRO payload launched today, which will significantly enhance the effectiveness and safety of the brave men and women defending our nation every day." 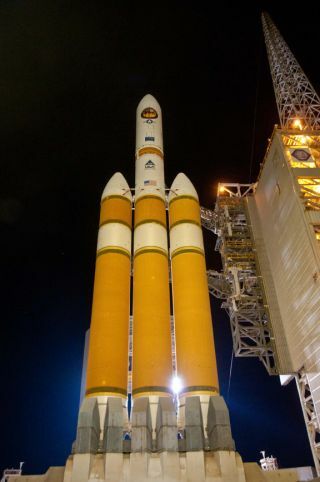 Like its name suggests, the Delta 4-Heavy rocket is a heavy-lift version of the expendable Delta 4 rocket, which is built by the United Launch Alliance — a joint venture of Lockheed Martin and Boeing. The rocket is actually made up of three boosters, each called a Common Booster Core, that are stacked side-by-side to give the vehicle a three-column look. Each Delta 4-Heavy rocket is capable of launching satellites or other payloads of up to 24 tons into low-Earth orbit, and up to 11 tons into the higher geosynchronous orbits commonly used by navigation and communications satellites. While the Delta 4-Heavy is the largest American rocket in service today, it is not the country's most powerful booster. The liquid-fueled Delta 4-Heavy generates about 2 million pounds of thrust. NASA's space shuttles, which launch using liquid-fueled rockets and twin solid-rocket boosters, generate nearly 7 million pounds of thrust, making the shuttle fleet the country's most powerful launch system today, United Launch Alliance spokesman Mike Rein explained. The next United Launch Alliance mission to fly is scheduled for March 4. That mission will use an unmanned Atlas 5 rocket to launch the Orbital Test Vehicle 2, the second test flight of the Air Force's robotic X-37B space plane. This story has been corrected to note that the SLC-6 launch complex was originally built in 1966 for the Air Force's Manned Orbiting Laboratory program and later adapted for NASA shuttles. You can follow SPACE.com Managing Editor Tariq Malik on Twitter @tariqjmalik.